New Delhi, Oct 29: Egypt President Abdel Fattah el-Sisi on Thursday called on President Pranab Mukherjee at Rashtrapati Bhavan here. “India greatly values its civilisational relationship with Egypt. India considers Egypt to be a major power in the region and a bridge between Asia and Africa,” he said. “Indian investments in Egypt have reached $3 billion. These investment flows bring technology, employ almost 35,000 Egyptians and contribute to high export earnings,” the president added. 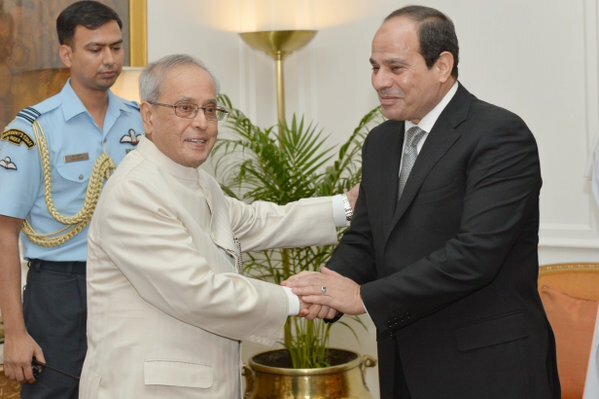 Mukherjee also congratulated the Egyptian government for the completion of the new Suez Canal in less than a year. “The development of new industrial zones around the new Suez Canal provides an opportunity to further strengthen economic ties,” he said. The president also evinced a desire to have India’s relationship with Egypt progress on three pillars namely closer political and security cooperation, deeper economic engagement and scientific collaboration as well as wider cultural contacts and people-to-people exchanges. Reciprocating Mukherjee’s sentiments, el-Sisi said his participation in the IAFS was inevitable considering the outstanding relations which bond Africa and India. “India-Egypt relations are historic, long established and continuing. Egypt is committed to further strengthening of the relations. It welcomes Indian investments and would like to benefit from India’s expertise, technologies and experience,” he said. Halle Berry’s Divorce Petition Invalid?